But the river crucial to its survival is being blighted by pollution, industry and deforestation. Campaigners believe the foundations have become brittle and are disintegrating. Cracks appeared last year in parts of the tomb, and the four minarets which surround the monument are showing signs of tilting. The Taj Mahal was built by Mogul emperor Shah Jahan, who was grief-stricken by the death of his wife Mumtaz Mahal in childbirth. It is India’s most famous tourist attraction, with around four million visitors a year. Its romantic image has attracted film stars and royalty, including Princess Diana, who posed in front of the building after the break down of her marriage to Prince Charles. A campaign group of historians, environmentalists and politicians say time is running out to prevent a ‘looming crisis’. 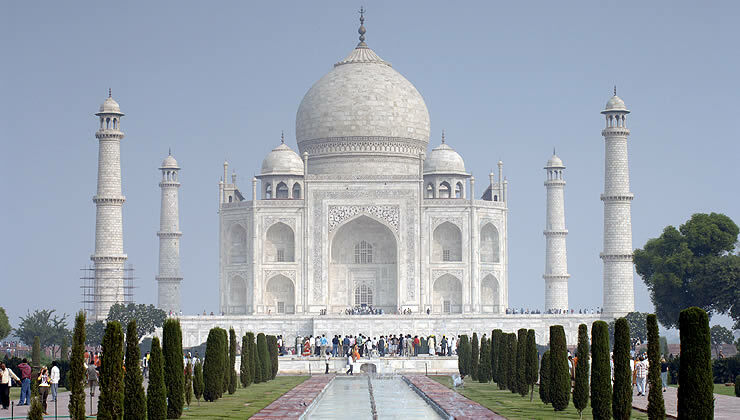 Ramshankar Katheria, the MP for Agra who is leading the campaign, said: ‘If the crisis is not tackled on a war-footing, the Taj Mahal will cave in between two and five years. ‘The architectural wonder of the world is losing its shine, and if this persists the minarets may also collapse since the wooden foundation – beneath the wells – is rotting due to lack of water. Professor Ram Nath, a historian who is one of the world’s leading authorities on the Taj, said: ‘The Taj stands just on the edge of the river Yamuna which has now dried up. The Yamuna River has fallen victim to India’s soaring growth. Large numbers of businesses draw water from the Yamuna upstream of the Taj. Pollution has increased as trees have been cut down to make way for new roads. The trees also protected the city from the worst effects of regular dust storms which now blow over the Taj unimpeded. The Taj is built on a raised platform on top of a hillock, which is based on wells underneath. The four 40ft high minarets balance the platform, and are designed to tilt slightly outwards, to prevent them crashing on top of the tomb in an earthquake. Mr Katheria said around £71million is needed to construct a barrage on the river. Environmental campaigners also believe a tree-planting campaign and a water pipeline may improve the situation. The sinking water level is also affecting India’s capital, New Delhi, which is at risk of suffering water shortages. The Indian government has set up body to deal with the Taj Mahal’s preservation. Officials connected with eight projects say the national and state governments are now working together to deal with the issue. BB Awasthi, regional officer of the Uttar Pradesh Pollution Control Board, said: ‘These projects have been held up since 2003 for want of funds.’ He said he expected the projects ‘would receive top priority treatment‘. The sinking water level is also affecting India’s capital, New Delhi, which is at risk of suffering water shortages. It is a Beautiful Pictures.It is a symbol truth of love.